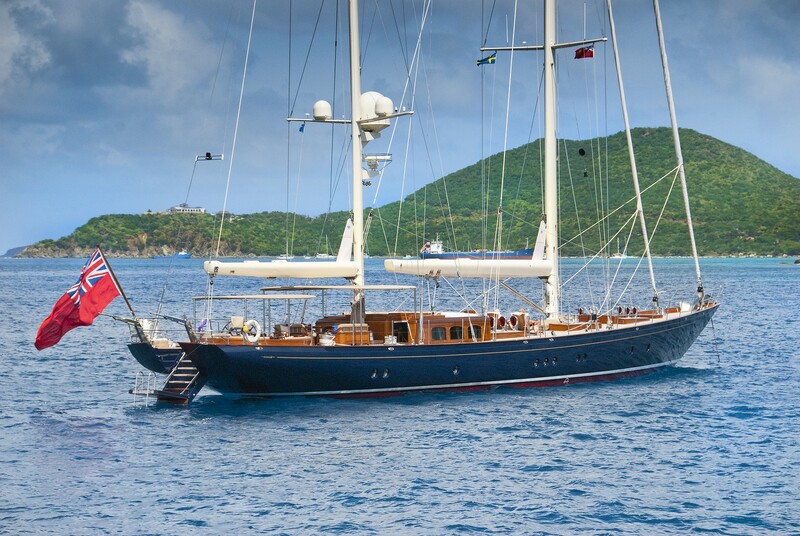 Read the full US Virgin Islands Charter Guide and the BVI Charter Guide. A 7-day private yacht charter itinerary visiting Tortola, St John, Virgin Gorda, Anegada and Jost Van Dyke. Join your yacht at midday at Sopers Hole on the West End of Tortola: the original home of the pirates. Today, trading can be a little easier with a visit to the shops at Pussers Landing. After a light lunch and chat about the itinerary, a 2 hour sail takes you to Norman Island (Treasure Island). Snorkel at the caves and be amazed at how many fish there are in the crystal clear waters. The evening is spent in the Bight, with a visit to The William Thornton for an after dinner party - a wild floating bar where everybody lets their hair down and tells their seafaring tales of the day...and how fast did you sail? After breakfast you can hike to the top of Spy Glass hill, a known lookout point for the pirates, be sure to take your camera. Dive or snorkel the Indians or Rainbow Canyon and swim with the sea turtles. After lunch it’s a short tack up to Peter Island, famous for its romantic beaches. Take an early evening stroll along the beach before a casually elegant dinner aboard. After dinner go forward to the trampolines and count the shooting stars, making a wish on each one you see. After breakfast a short sail to Salt Island to dive or snorkel the Rhone; this is one of the top five wreck dives in the world. Then motor round to Cooper Island for lunch and some spectacular snorkeling off Cistern point, a sheltered reef alive with juvenile fish of endless varieties. Alternatively, take a stroll on the beach, sit under a palm tree and just take in the beauty of the turquoise waters. A late afternoon sail takes us to Marina Cay for the evening, one of the smallest of the Virgin Islands. A morning sail can take you to the Dog Islands for some colourful coral dives or you can visit the Baths on Virgin Gorda. These spectacular rock formations below and above water can be explored by land or sea and snorkelling here is a must. Lunch is just outside Spanish Town, so you can shop or take a taxi for an Island tour. Then a fast sail up the west side of Virgin Gorda one of the most beautiful of the Virgin Islands. In the evening, dance at the Bitter End Yacht Club to the local reggae band in the elegant settings that this resort offers. Spend the morning enjoying the North Sound - truly one of the most outstanding natural harbours in the Caribbean. Enjoy good windsurfing, snorkeling, hiking and shopping here. Visit the four exclusive resorts and take on some shore duty. Or, sail to Anegada, the sunken land nestled within a horseshoe reef, the third largest barrier reef in the world. For the first half of this 2/3 hour sail there is no land visible, then the palm tree’s appear on the horizon warning of your imminent arrival. After lunch absorb the atmosphere of the anchorage at Setting Point. Informality and relaxation are the key elements of Anegada. Deserted beaches, fringed reefs and the unique flora and fauna of the salt ponds, home to the pink flamingo, await your exploration. Lobster dinner at the Anegada Reef Hotel is a must. As darkness falls, with cocktail in hand, you will see from the cockpit of the boat the driftwood fires on the beach grilling your lobster. The open air restaurant in and around the beach promises a dining experience only Anegada can offer. An early start from Anegada ensures plenty of time to sail back to enjoy the snorkelling off Guana Island or dive Camanoe Island. Off the Eastern end of Tortola are several small secluded anchorage’s. If evening entertainment is your choice Trellis Bay is the home of the Last Resort, which offers a nightly comedy show based on yachts who come and visit the British Virgin Islands. A leisurely downwind sail to Jost Van Dyke offers ample opportunity for stopping on the way. Cane Garden Bay, Sandy Spit and Green Cay are all places of exceptional beauty. Just take your pick. For the over night stop, White Bay is secluded and quiet with only the Soggy Dollar Bar ashore or Great Harbor is ideal for those who would like to visit the famous Foxy’s Tamarind Bar. Sample his Sly fox or Dread fox both made from Foxy’s firewater rum and listen to his calypso songs. Beware you’ll probably be in one! The last morning! Choose your breakfast from a light selection of assorted breads and fresh tropical fruits, to champagne and eggs Benedict. A swim or snorkel before sailing back to West End for that last minute shopping before joining your homeward flight.